The application is still in beta, so it is not complete. There is room for improvement in both speed and user interface. Please check the app out and leave a review! MusicMinder – Beta is an app to help you keep track of songs you hear while out and about. When you hear a new song, you can add it to you MusicMinder song list to help you remember everything about it, and to help you look up more information about it too! The alpha version of my first application, MusicMinder, is now complete. 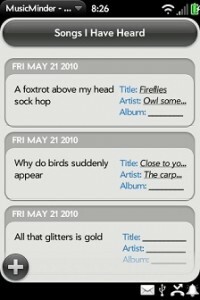 This application is to help you keep track of songs you hear while out and about. When you start up the app, you are presented with a list view of the current songs, which display the lyrics you entered, along with the location at which you heard the song. Tapping on the plus button at the bottom allows you to add a new song to the list. from here you can enter in where you head the song, some of the lyrics, as well as the artist, title, and any additional notes you wold like to save. The button on this page do exactly what you would expect. Click on the search lyrics button, and you are taken to a Google search of the lyrics you have entered. Click on the Youtube button to do a Youtube search, and click on the Amazon button to search amazon’s mp3 store for the song. Press save or do a back gesture to go back to the list of all of your songs. Tapping on any song lets you edit any of the information that you have about it. Swiping a song allows you to delete it from the list permanently.